Yorkshire terriers are vibrant and independent small dogs. The Yorkshire terrier, or Yorkie, is a small breed of dog developed in Yorkshire, England. Yorkie dogs are known for their vibrant and playful personalities as well as for their long hair and their miniature stature. The Yorkie typically does not exceed 7 pounds. The growth stages of the Yorkie are similar to those of any dog; the big difference that factors into the stages is your Yorkie's personality. From the moment your Yorkie is born until she is about 2 weeks of age, her greatest bond is with her mother. During this time, her sense of touch and taste are present. From 2 to 4 weeks of age, her siblings become more influential on her, her eyes open, and her senses of hearing and smell increase. At 5 weeks she is walking and barking, two abilities that will be very important during her socialization and playtime. From 8 weeks on, she can be separated from her mother and siblings. Imprinting begins during your Yorkie's puppyhood. Yorkies, especially the very small "teacup" Yorkies, can become overwhelmed by intense or loud surroundings. Yorkies 8 to 10 weeks old experience fear in permanent ways, and then experience another fear stage at 16 weeks of age. From the time you bring your Yorkie home at 7 weeks to 8 weeks until the time she is 6 months old, training and socialization are crucial. Slowly and carefully introduce her to new situations and surroundings, such as dog parks, car rides and outdoor activities. Provide her with consistent puppy obedience training and ensure that she has the opportunity to socialize with other dogs and humans alike. 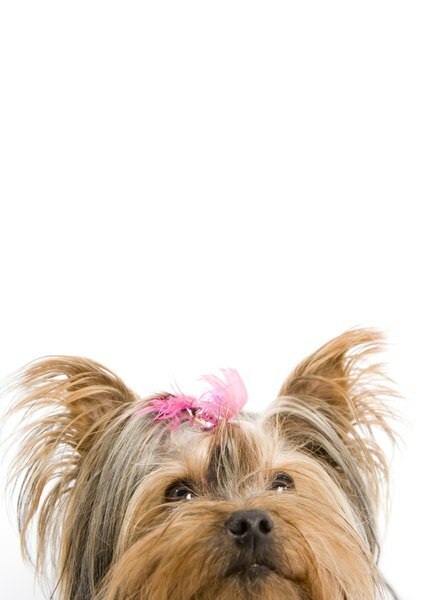 From 6 months to about 2 years, your Yorkshire terrier will be in her adolescent phase. During this time she is greatly influenced by you as well as other dogs in the house. This juvenile period is marked by increased shows of independence and dominance, and, in the case of dogs that haven't been spayed or neutered, sexual behavior. By the time your Yorkie is 2 to 3 years old, she will settle into adulthood. While training is still important, the socialization personality of your Yorkie is resistant to change during adulthood. Although Yorkies can live to be 20, around the age of 12 is when they exhibit signs of seniority. Signs of aging include general slowing down and taking longer to get up from a seated or reclining position. At this time, change to a dog formula crafted specially for older dogs, and incorporate supplements to help with arthritis and sore joints. Speak to your vet regarding these and other dietary changes beforehand. Expect for your dog's hearing and sight to fade. Take care when asking your Yorkie to go up and down stairs; pick her up to join you on couches or your bed. NetPlaces: When Is a Yorkie a Senior?